Throw a rocking 16th birthday party and decorate with these vibrant 16th Whirls. The 16th Whirls (5/pkg) are a great way to decorate your ceiling to jazz up some empty space. 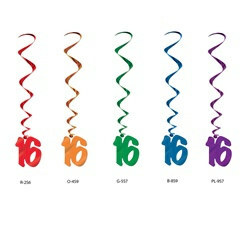 The "16" Whirls are sold in an assorted pack with multicolored decoration making the 16th Whirls perfect for matching with any other vibrant or multicolor decorations. Each package includes 5 whirls each measuring 40 inches in length. Much Larger then I expected was pleasantly surprised.